Tuesday, January 21, 2014 begins a busy post-MLK, Jr. holiday week when the Costa Mesa City Council will hold the second meeting of this new year in Council Chambers at City Hall beginning at 6:00 (A Closed Session precedes it at 5:00), and there's no way to predict the length of the meeting. You can read the full agenda HERE. Dougherty & Dougherty Architects $3,761.50 for design work on City Hall and PD entry way. IntelliBridge Partners, LLC $10,069.51 for Purchasing Assistance (See New Business #3, below). Keyser Marston Associates, Inc. $9,780 for professional services. (They work on the homeless housing stuff for us). Liebert Cassidy Whitmore $3,378.90 for legal services (they are our contract negotiators). US Bank for $20,867.37 for Miscellaneous Procurement Card Purchases. Seems like a lot of "miscellaneous" stuff. 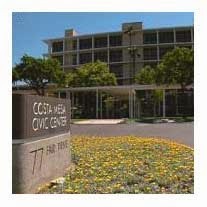 Costa Mesa Conference and Visitor Bureau $167,025.42 for November. David Volz Design $28,268.39 for several items, including two charges for "Fairview Boardwalk Project" - a project that has been quashed by outside agencies. Beyond The Office Door, LLC $9,982.82 for a Chair, Sofa and Table! For Whom? FTOG Inc $2,745.00 for an Interim Buyer (see NB#3 below). Scientific Resource Surverys, Inc. $9,905.50 for Fairview Park Cultural Assessment. The previous agenda had five (5) warrants on it, which can explain why this one was a little thin. The only Public Hearing on the agenda is the approval of the General Plan Housing Element, something that MUST be done soon or we will be forced to revisit this issue every four years instead of eight, as is now the case. That agenda item is HERE. This work product is the result of numerous meetings, dating back to last spring, including several public workshops and a booth at the 60th Anniversary Celebration, at which community input was gathered. There is no Old Business on the agenda, but there are three New Business items listed. The first, HERE, is a General Plan screening request for an 89-unit development on Whittier Avenue which includes several live/work units. The second New Business item is the so-called Excessive Use Of Services Ordinance - the club Mayor Jim Righeimer plans to use to flog "problem motels" into submission. You can read the staff report HERE and the method of calculating the charge for that excessive use HERE. At $360 a pop beyond your authorized number of calls, it won't take long for motel owners to feel pretty darn oppressed. I'll be watching for the first lawsuits to hit us on this issue - probably no later than March. The final item on the agenda, New Business #3, HERE, is the proposed reorganization and addition of a dozen new positions, including the creation of yet another Assistant Chief Executive Officer position! This one will also hold the tag of Administrative Services Director. I covered this item at length in a previous entry, HERE. City Hall sure seems to be getting top heavy these days! And, yes, this proposal would add four more police officers, bringing the total authorized to 136. However, we're a long, long way from that many pairs of boots on the ground today. This is just the first of several meetings this week. I'll cover the others in another post. In the meantime, sit back and enjoy the football playoff games.. I know I will! Broncos over the Pats by 6. Seahawks over the 49rs by 9. Enjoy! Ten grand for a chair, sofa and table? What, is it made of gold? Didn't get it at IKEA, that's for sure. The brand is clearly strong! I suspect the chair, table and couch are reception type furniture. But I wonder why and where? I am curious about almost $29,000.00 to that group for the boardwalk, just to be told no. What did they do for that money? Guess we'll have to go down and pull some more paper. And they wonder why the requests are up? houses next to single family homes-- but after watching the "vision meeting"
it seems ALL of the planning commissioners and city council think they are a great idea. i'm so disappointed. Xyn, its because they are all upset that there are more renters than homeowners. So they are trying to balance that out on our backs. I got news for them. It ain't gonna work. They can congest all they want, but they will never get the odds to flip. All the city council thinks it's a good idea? I got to make me some phone calls! I was expecting another 3-2 vote. You were scary-accurate in your football picks this week, Geoff. Should be a good Super Bowl... Denver a 2 point favorite.